I have been a great fan of Scotch Box. If you had not heard about it, it's a light-weight Vagrant LAMP Stack that has a huge load of awesomeness in it. It is frequently kept up to date by Nicholas Cerminara. So, that's too good to be true, then what are all its features? That's super cool right? So what are you waiting for? Go ahead and purchase the Scotch Box Pro! It's a one time purchase and you get to have unlimited downloads! The recent release of Scotch Box Pro, as is currently is unable to create the Virtual Hosts based on the information given in the website: Multiple Domains (Virtual Hosts) as the required scotchbox.local.conf is not bundled with the virtual machine. Manually SSHing into the machine, creating the file scotchbox.local.conf from default.conf and running the Shell Provisioners. Creating the file scotchbox.local.conf using the Shell Provisioner and working the way out for the other domains. 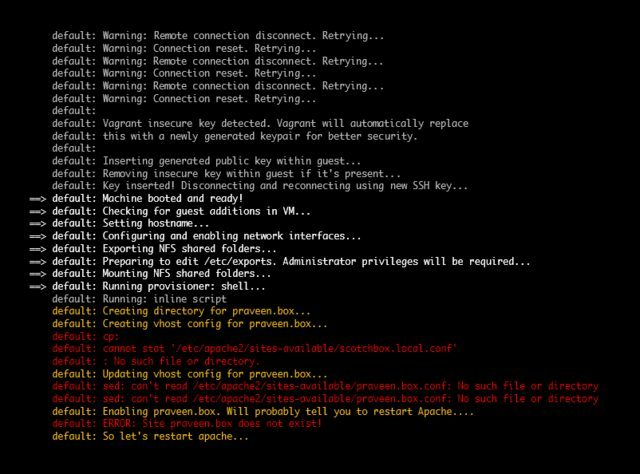 Creating the Virtual Hosts configurations inline using the Shell Provisioner. I'll go in detail on each method and you choose the best one for you. I chose the first method of copying the contents manually, if this helps. Now save the file by exactly pressing Esc key, then : key and type wq making it look like this in the footer and press Enter. echo "Creating directory for $DOMAIN..."
echo "Creating vhost config for $DOMAIN..."
echo "Updating vhost config for $DOMAIN..."
echo "Enabling $DOMAIN. Will probably tell you to restart Apache..."
echo "So let's restart apache..."
Now try running vagrant provision command to perform the provisioning. The provisioning starts again and you will find the results being positive. This method doesn't make you go into the SSH, but also beware, this method has not been tested with all the computers. 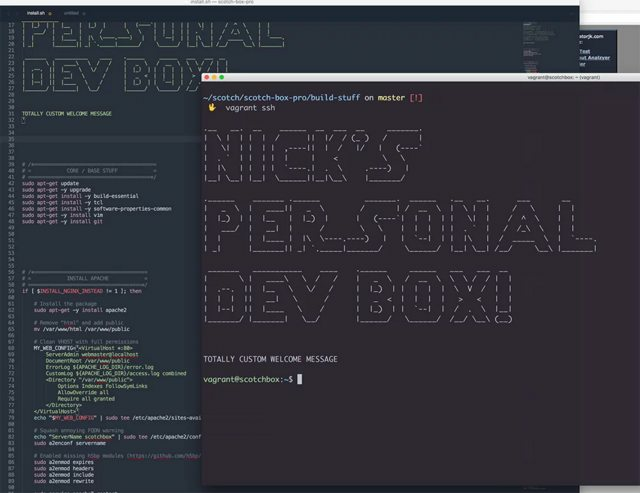 The only thing you will be doing is to edit the Vagrantfile to include the creation of scotchbox.local.conf on the fly using the provisioners and copying them for your domains. ## Create the scotchbox.local.conf inline. echo "Creating vhost config for scotchbox.local..."
After saving the file, try running vagrant provision command to perform the provisioning. The provisioning starts again and you will find the results being positive. This method doesn't make you go into the SSH as well, but also beware, this method has not been tested with all the computers. The only thing you will be doing is to edit the Vagrantfile to include the creation of domain's .conf on the fly using the provisioners.